Social media is not available because you have not accepted cookies. If you want to adopt one or more specific names you can search for them in our database. It is also possible to adopt a number of names. Your certificate will then state the exact number of names only. This option is intended primarily for businesses, schools and other organizations that want to adopt collectively. For example, one name for each member of staff or for each class. Is there a name missing or did you find out some details are not correct? Is the name you searched for missing or do you want to report a correction on one or more names? Then please use the correction form and help to improve the database. Example off an adoption certificate. 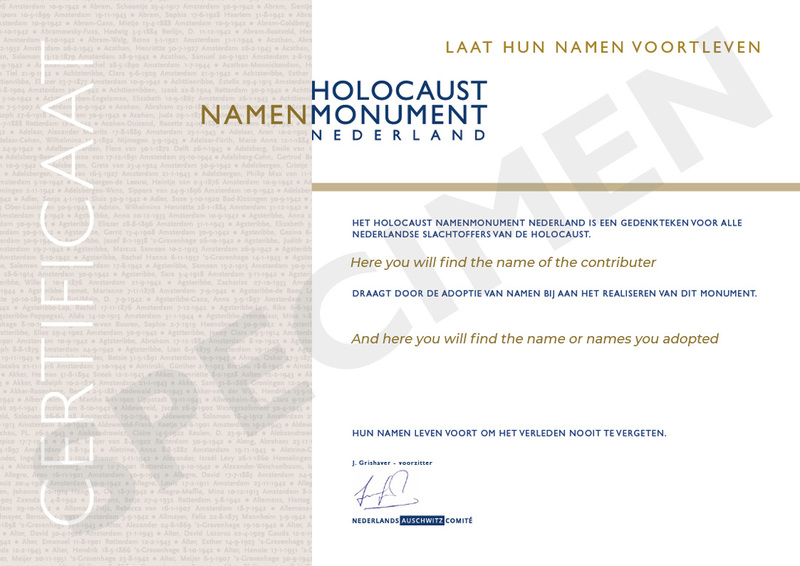 Please note that the certificate will be written in Dutch.